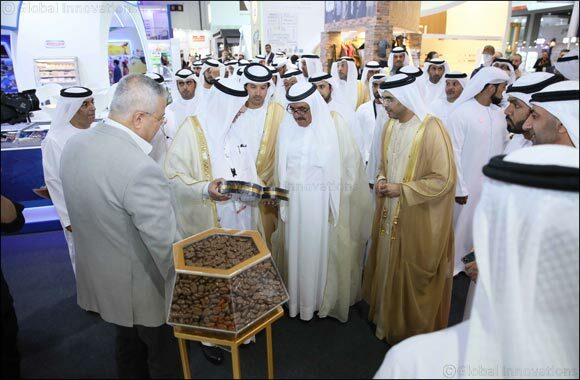 Dubai, UAE – 17 February, 2019: HH Sheikh Hamdan bin Rashid Al Maktoum, Deputy Ruler of Dubai and UAE Minister of Finance, today opened Gulfood 2019, the 24th edition of the world’s largest annual food and beverage trade show at Dubai World Trade Centre (DWTC). The five-day mega exhibition, which runs until Thursday 21 February, has once again attracted high-calibre interest including ministers, top trade envoys and national organisations from the four corners of the globe. The show offers a platform for game-changing business deals, new market opportunities and emerging trends while setting the agenda for the future of food. Touring the 1,000,000 sq. feet mega exhibition, HH Sheikh Hamdan, accompanied by His Excellency Helal Saeed Al Marri, Director General of Dubai World Trade Centre Authority (DWTCA) and Director General of the Department of Tourism and Commerce Marketing (DTCM), was given a snapshot of the latest products from 5,000 local, regional and international exhibitors eager to show they have the solutions to meet rising food demand in the region and beyond. Top-level trade missions have converged on Gulfood 2019 from 198 countries to highlight the quality and diversity of their products to feed the region’s needs. The Gulfood Global Industry Outlook Report 2019, complied by Euromonitor International, which is officially released at the show, forecasts F&B sales in the Middle East & North Africa (MENA) region will rise from USD145.4 billion in 2018 to USD171.2 billion by 2023 at a Compound Annual Growth Rate (CAGR) of 3.33 per cent. Running alongside the main exhibition, the new three-day Gulfood Innovation Summit will bring together some the major players in the industry to examine the latest challenges and opportunities in the global F&B landscape. Starting tomorrow and running until Wednesday 20 February, Summit highlights include a keynote titled ‘Future of Food & Wellbeing’ from Dr Nigel Hughes, SVP Research and Development, Kelloggs, on Tuesday 19 February; a ‘Fireside Chat: The Growth of Private Label in MENA’ with Miguel Povedano, COO, Carrefour-Majid Al Futtaim; and a session titled ‘Smart Operations – Focusing on AI for supply chain’ with Mike Yesudas, Chief Technology Officer and Distinguished Engineer, IBM, plus many more. New, engaging features have been added to the 24th edition of the world’s largest annual food and beverage trade show to further enhance the experience for all attendees. Tastes of the World will see Michelin-starred chefs and kitchen captains showing off their skills in a range of masterclasses and live cook-offs, including the first-ever Gulfood International Culinary League, in which four teams, representing Asia, Europe, Middle East and The Americas, will each have 60 minutes to prepare a three-course menu showcasing the distinctive dishes and techniques from their regions. Other new features at Gulfood 2019, which is being held under the theme The World of Good. The World of Food, include Tea House, which will demonstrate the versality of tea with masterclasses, tasting sessions, food pairings and other insights; and Barbecue Masters, which features live cooking contests and demonstrations by world-renowned chefs and open-fire pit masters. Elsewhere, CxO Club is an invite-only social breakfast club for industry decision-makers and free-styling food executives; the Gulfood Discover Zone will enable show-goers to see select product innovations available at the show in an interactive display, and the Cezve/Ibrik Championship & UAE National Cup Tasters, will see world-class baristas demonstrating expert brewing techniques and offering sampling sessions. Gulfood 2019 is a trade event open strictly to business and trade visitors. The show is open 11am-7pm from February 17 – 20 and 11am-5pm on February 21.